A scholarly study of what increasingly passes for business as usual in many American prisons: the execution of the condemned. Capital punishment, maintains Zimring (Law/Berkeley), is barbaric, a throwback to an earlier age. Much of the world has now rejected it. Even so, American states have more and more resorted to killing prisoners. “By the year 2000,” he writes, “the volume of executions by American states had bounced back to levels quite close to those experienced during the early 1950s,” the decade in which the number of state-sanctioned killings began to fall sharply from earlier historic highs. But not every state uses capital punishment as the ultimate payback for crime, and while some states (e.g., New Hampshire, New Jersey, and South Dakota) keep the possibility of it on the books, it is only rarely applied outside the American South. Texas, Virginia, and Oklahoma conducted more than two-thirds of all executions in the past two decades. Texas alone, Zimring notes, “executes more people . . . in an average year than had been executed in the quarter of a century after 1977 in the four most populous northern states that have experienced any executions.” The author observes that these southern states, and others that employ capital punishment, are precisely those in which vigilante and mob justice prevailed. In other words, there is a historical continuum that runs from extrajudicial to judicial execution: “The lynch mob and the lethal injection are found in the same American neighborhoods”—but scarcely anywhere else in the civilized world. 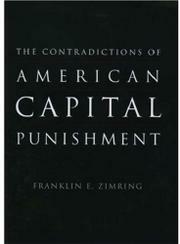 Ending capital punishment, Zimring argues, will involve the resolution of long-running disputes in American history over state and community rights versus those of the federal government, disputes that rage strongest in just those places where executions, and lynchings, were and are still common. Thought-provoking, well-founded ammunition for the endless debate over capital punishment.